Tauranga Coastguard operations manager Dane Robertson. There are dozens of good reasons to join Tauranga Coastguard, but this year there’s an extra incentive to do so in the months of February and March. Simply by signing up to become a new member either online or in person at their Sulphur Point headquarters, you’ll be automatically entered into a draw to win one of two prize packages worth $1000 in total. 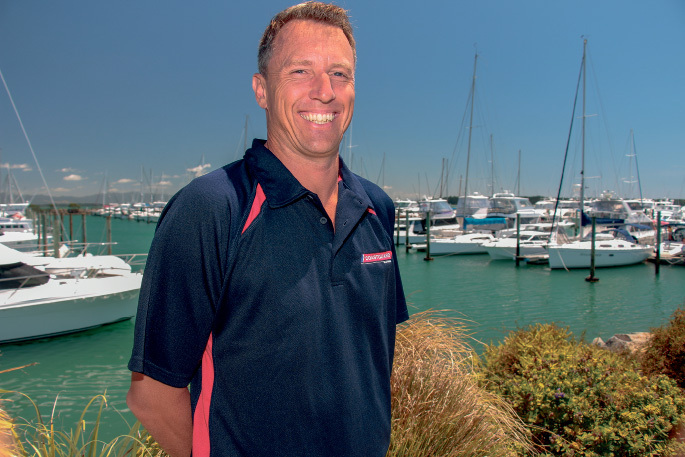 Tauranga Coastguard operations manager Dane Robertson says: “It’s easy to sign up online, but in a way it’s nicer for people to come down to Sulphur Point, because they can see our volunteers and get a feel for what it’s all about. “Some visitors have even ended up asking what they could do to help and become volunteers themselves. The former Kaimai School principal, who joined Coastguard at the beginning of December last year, adds: “People don’t often see the value in becoming a member until they’re out on the water and they’ve run out of fuel or their boat won’t start. For more information, go to: www.taurangacoastguard.co.nz/Membership/Join, visit the Tauranga Coastguard Facebook page, call 07 578 5579 or drop in to their premises at Sulphur Point, Tauranga.